There are limits to how many times one can play a simple scenario over and over again. 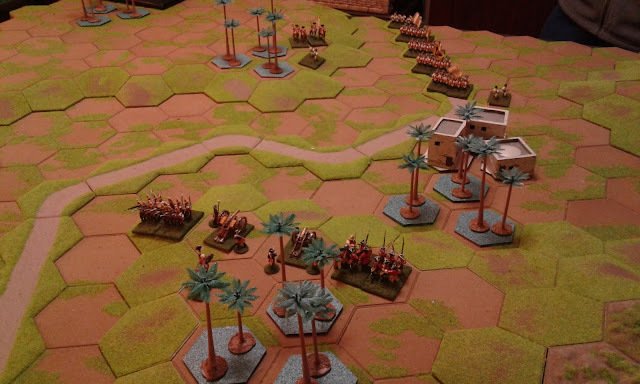 I did do a quick run through with the first draft of the revised Prince Valiant rules and they worked ok but a bit too fast and simple for such small forces. I decided to try the Armour Save version which allows more nuances and made one or two other tweaks but could not face another run through of the rearguard. A quick flip through scenarios suitable for the existing river suggested "An Unfortunate Oversight" in which the attacker sneaks over a ford while the defender is massed around the only bridge. "Release me and Rome shall acknowledge you as King of all the tribes from here to Portlandia and pay you a wagon full of gold." The Romans had 1 unit of armoured Roman cavalry with bows, a unit of archers and a unit of armoured infantry while their Armorican allies had a unit of armoured shock cavalry and two units of infantry. All of these were massed around a village just off camera. 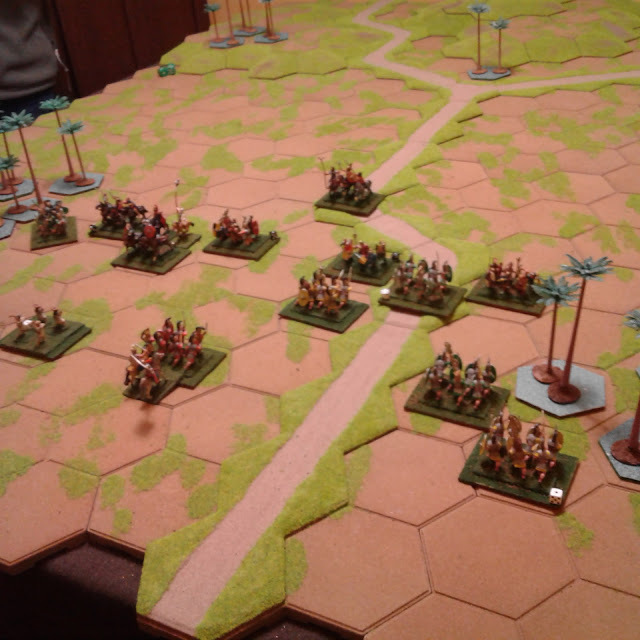 The Huns had 2 units of Hunnish horse archers and a unit of foot archers. Their Rugii allies had a unit of Elite Shock infantry, a unit of infantry and a unit of archers. Somewhere around turn 4. 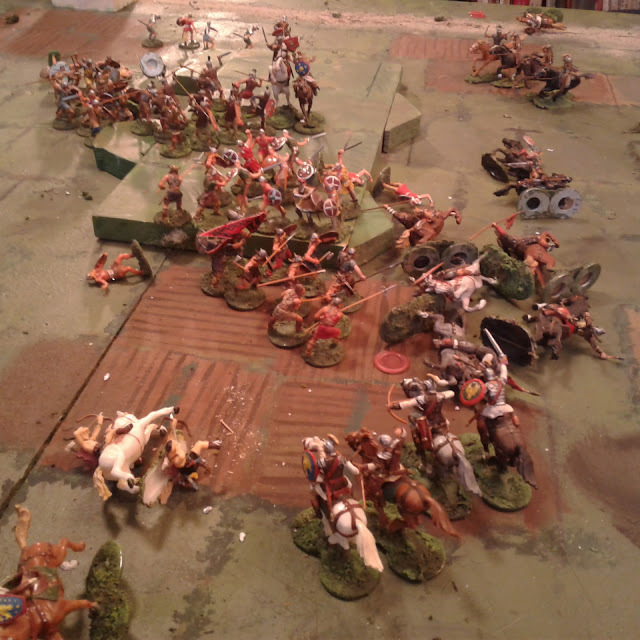 The Hun cavalry has surrounded the Romans on the hill but the table is too small and one unit has been caught by an initiative flip and routed off table by the Roman cavalry. It was a quick game with several turns of fortune and a nail biter finish. A really satisfying straight up game using these rules would need larger forces and a more complex scenario but that was rather the point. For a multi-player, 3-4 hour convention game on a table twice this size with more than twice the forces, most being independent with several being nonaligned, all with secret individual victory conditions, I want simple, easy to grasp combat rules so players can focus on the rest. I need to polish the writing a bit and write out some of the assumptions but these will do. In any event the players will only have a one page summary and a verbal briefing to guide them and I trust my co-GM's judgement should things crop up mid-game. The current version of these 2 page Castle Dangerous rules can be accessed here. Several turns later: its all a bit of a bloody mess. The Hun King was slain early on in single combat against the Armorican Duke who was in turn slain by the King of the Rugii several turns later. What is left of the Allied infantry is surrounded on the hill but the remnants of the Roman cavalry are rushing back to the rescue. The Rugii however are tough and inspired by their King and it all ends as seen in the first picture. Five months and change to go. The next step is to muster the painted troops, organize units under the new system, form 8 contingents each with a character leader and and assess what needs doing in terms of basing, repairs, painting touch up for some of the recruits (often a wash of burnt umber will do but...), and probably addition and conversion of new recruits from the unpainted kit supply. I know I have enough for 3 units per player but would prefer to provide 4 if I can. I also want to find a way to id units to help players, armour or hair/helmet style, shield colours etc but if all else fails a colour swatch on the bottom of the base. Oh and add the siege bits since the setting involves the Huns and their allies besieging a castle. While doing the practical bits, I also need to come up with names for the 8 factions and the characters for each as well as a back story, individual victory conditions and background and so on as well as table layout. (Not that I'll be able to blog that stuff till late May.) The only time I designed and ran a game of this sort as primary GM was over 12 years ago and I spent most of my time worrying what to do if I only had 3 or 4 players show up for an 8 player, 8 am Saturday morning game and none of my time planning to cope with 16 players. Luckily it all worked out with 8 teams of 2 friends each. After much thought about rules, I remembered that my toy soldier collection was supposed to be about quick, simple games not about getting into details of command control and small unit tactics. The table was supposed to have been cleared already but hadn't been, so I played the scenario again using my standard Tin Army rules without hasty modification and they worked just fine. While debating what scenario to play next, I remembered the need to resume preparation for Huzzah, so I cleared away the old toy soldiers. Romans in hot pursuit of a Barbarian raiding party. The "Prince Valiant and the Siege of Castle Dangerous" game that I am planning is supposed to be a chaotic, multi-player, no fixed sides, personal victory conditions only, sort of game. I have decided that it would be best run using very simple combat and movement rules so that players can focus on the rest. With this in mind I have written a sketchy draft of a simple set of rules drawing heavily from the Gathering of Hosts but based on units of single figures not on elements. Since the table STILL hasn't been cleared, I reset with the Elastolins in anticipation of a test game in the near future. Minifig Horse Grenadiers, which I painted for Ron a few years ago, going into their first battle. Ron suggested that we start with the Ancient rules since they had light & heavy cavalry and infantry as well as artillery however he also suggested that we face the hex angles to give the game a more linear feel. This would give each unit 2 front hexes, 2 flank and 2 rear and meant battle lines were needed to protect units. It worked like a charm. 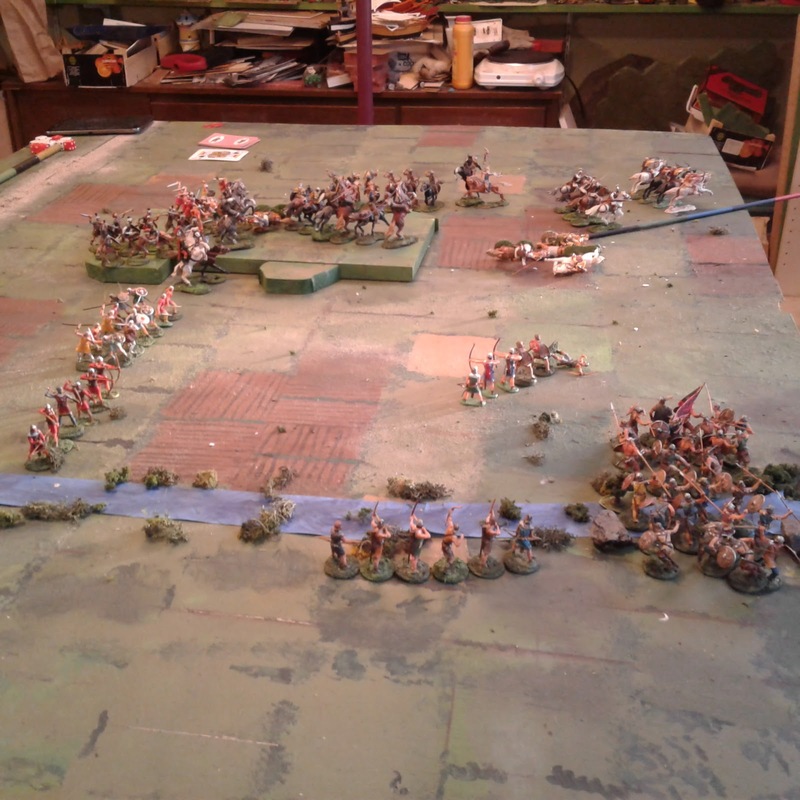 Turn 2, on the next turn the Hessians in the town wuld spring an ambush by opening fire. We did make a few other minor changes midgame as we came across anomalies. One was to disallow artillery fire over head on the flat as being not only technically problematic, apart possibly from howitzers, but also contrary to customary artillery deployment at the time. Turn 6ish?. 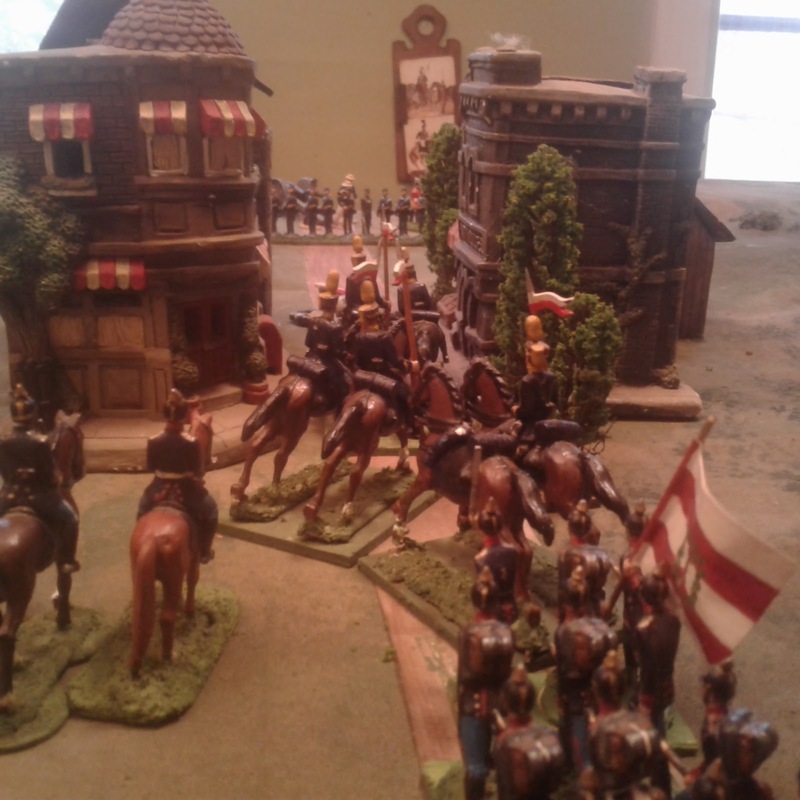 The Austrian army is deployed and pressing forward (The Austrian right wing of Cavalry and infantry is off screen). My reserves are still hidden in dead ground but it is early days. Ron had a seemingly endless horde of bullet proof troops. My plan was to do as much damage as possible while allowing myself to be pushed back to my main position, holding the cavalry for a counter-attack if I saw an opening. As far as I could see Ron's plan was to deploy while testing my positions and then advance minimizing his own casualties, making use of his numbers and taking no risks unless it became necessary near the end. Turn 9/10ish? Both sides' battle lines are deployed. I have fallen back to my primary position across the narrowest part of the pass and remain fairly confident that I can hold till dark. It appears that I made several serious miscalculations but the big one was assuming that given average die rolls, the distribution of SP loss and Recoil results would be fairly even given the 50/50 results chart. They were even except that while my smaller army inflicted mostly recoils, it suffered mostly SP losses! The net result of this was that I was forced to launch my cavalry counter attack earlier than planned or lose the ability to do so at all as I rapidly approached my Exhaustion Point while Ron's army arrived at the crucial point fresh and had been scarcely slowed by having individual units recoiled. If the dice results had been reversed my plan might have worked but it is a desperate plan that relies on dice! Turn 13. My army is exhausted and Ron has blown a huge whole through my line. There was nothing to do but retreat the 2 battalions on my left and surrender the surrounded ones on my right. Once again, the way the EP works makes reserves next to useless for a small army unless committed near the start of the battle or unless the army can avoid taking damage at all. My mind has been pondering things such as dividing an army into Brigades or Divisions, each with their own Exhaustion Point so that a Reserve can be kept but on the other hand if my troops had been pushed back more often early on instead of losing SP's, then my Reserve cavalry would not have been forced to attack early or not at all. An all out attack on the head of Ron's army as he deployed (like his in the last game) would have given me a much better chance of inflicting enough damage to exhaust his army before it made it through the gap as long as some of my units remained alive near the end. I'm not sure how well a Fabian plan of not contesting his advance across the first 2/3 of the table other than by showing ambushes and retreating before contact would have worked. 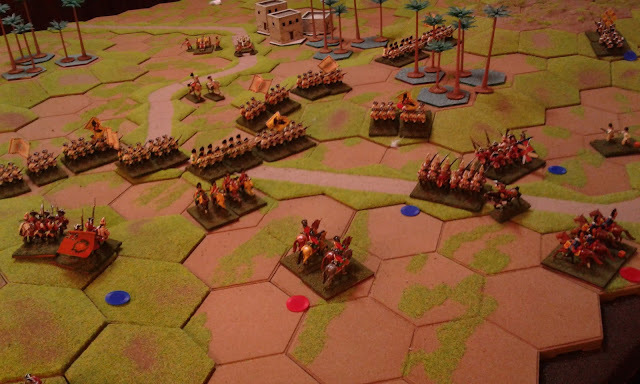 His rear elements were barely slowed as it was and possibly the battle would have started in earnest with my troops fresh on the last position, roughly around the same time as my army was teetering on the verge of exhaustion. That also might have worked. One of my current aims is to have each of my collections provide a different sort of gaming experience. This is a relatively new aim for me and sometimes I have to remind myself. The left hand Canadian column consisting of 4 companies of Highlanders supported by a gun were soon over the ford and hot on the tails of the Fenians but on the right, The Victoria Rifles, GG Foot Guards and 2 companies of elite Scots Guards supported by a troop of Hussars and the GG Bodyguard were stalled as the 19th Ohio (Irish Republican Volunteers) threw back attack after attack. In younger days I dreamt of having a relatively constant ground and figure scale across periods and sizes of battles so one could see the difference in army size and deployment and weapon ranges. Not really practical for most of us but I still like the idea of small battles making smaller games with ground scale being constant-ish across periods though not necessarily figure scales. On the left, the Buffalo Regiment, ensconced in a wood, are now holding up the advance of the Highlanders but at last, at great cost, the Scots Guards have cleared the way for the right hand column. My original plan was to use the same square grid rules I've been using for my 40mm late 19th/20thC Atlantica games but not only did it not feel different but they didn't 'feel' quite right. Something about the figures and the background called out for something different. I started by looking at more detail as befitting a lower level of action but that wasn't it. Eventually I realized that the big shiny toys, while happy on the grid, just wanted something with a more traditional wargaming 'feel' (what ever that is). 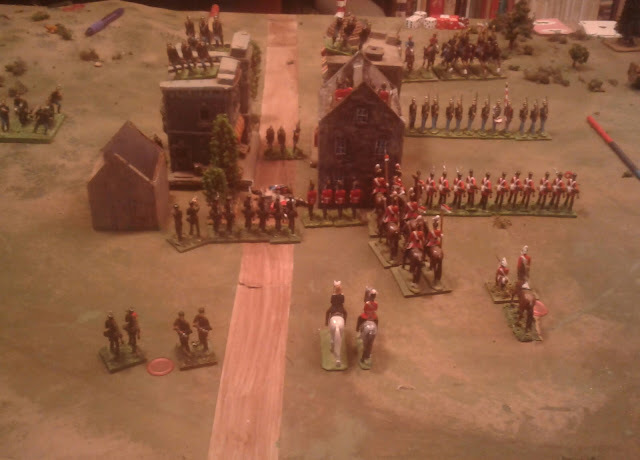 After various mid-game changes and experiments (and a narrow, unrecorded Fenian victory) I decided to do a new set of rules from scratch and replay the scenario. So, this game was played with a hasty hash of some old ideas experimented with last year and the year before and some of my usual things. As the sun sinks the battered Anglo-Canadian force closes in on the Fenian position. If the Fenians can hold the mouth of the pass till nightfall, they will be able to slip through and regroup and the campaign will go on. Since incomplete re-basing led to many single figures, the temptation to remove figures and reduce unit's combat effectiveness with each hit was VERY strong but the historical casualty levels were so low that I forced myself to resist. Once I get the basing finished it'll be easier. It all worked well but given the low level of the action and the visual impact I think I'm going to lengthen the ranges and give it all another good going over now that I think I understand the sort of thing I'm looking for, and maybe test some of the alternative proposals a bit more. It also occured to me that I should play some more full table games or I might end up reducing my table to 4' x 4' and using the extra floor space for something else! 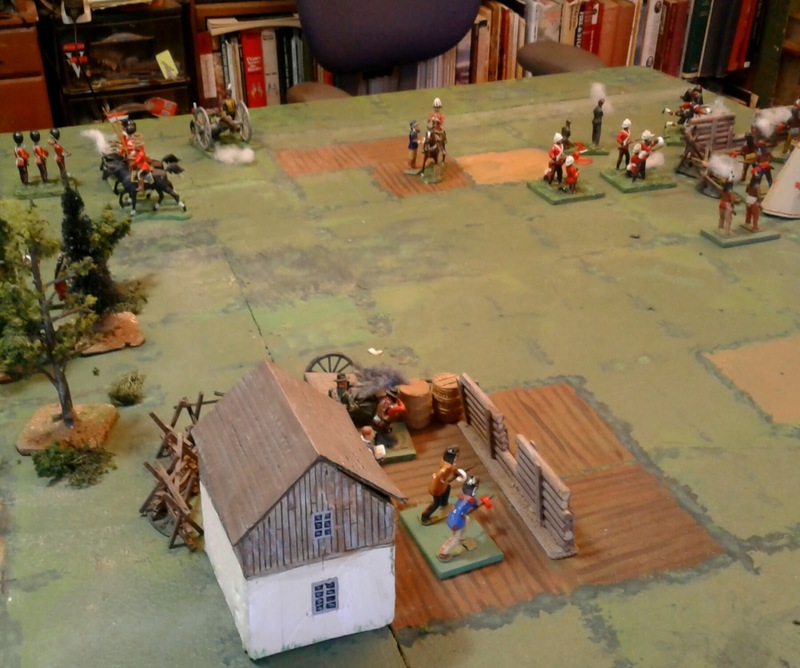 In keeping with my mini-campaign hopes I decided that the next game should be some form of rearguard action as the Fenian forces fall back towards the border. It was at this point that I realized that they had been attacking from the East in the last game so I decided to shift the axis 90 degrees and see how the offset squares feel when going along the grain rather than against it. So here they are retreating south, across the Yamaska and towards Iron Hill. Run! Run for the Hills! The Redcoats are coming! 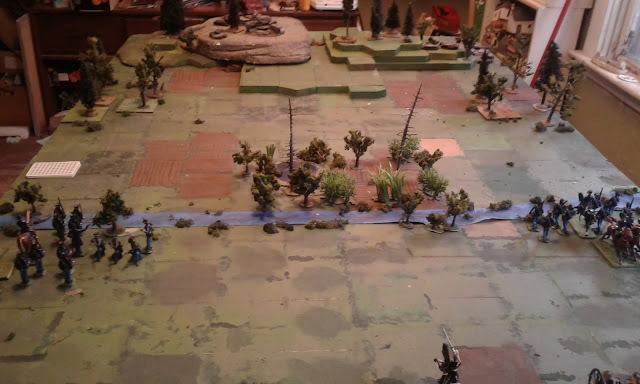 Please don't bother google mapping to see if the geography is accurate in any but the broadest sense of Iron Hill being between the Yamaska and the US Border, the terrain is straight out of One Hour Wargames, Scenario 20 . (See Incident at Rocky Top Hill from 2016) . 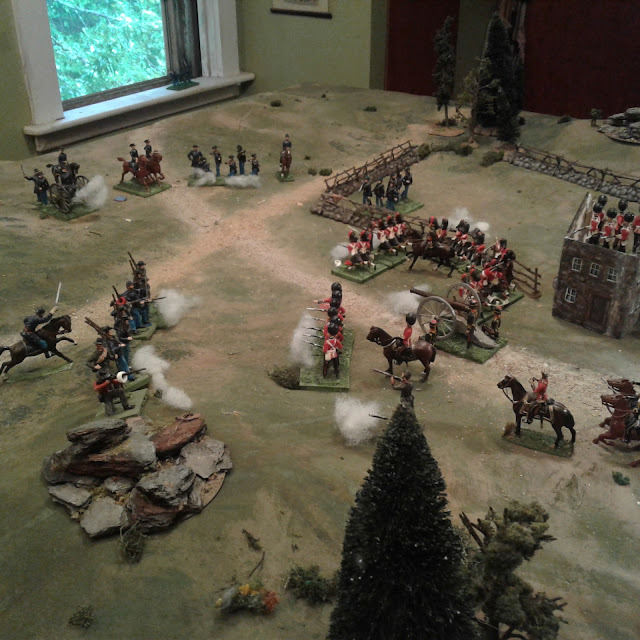 The rugged high ground at the southern edge is actually off table as is the barely visible Major Denison with the Anglo-Canadian forces. Yes, Yes I know, geometrically speaking, squares cannot have 6 sides, however functionally these ones do since they share boundaries with 6 other squares and to cut to the chase, they worked like a charm! 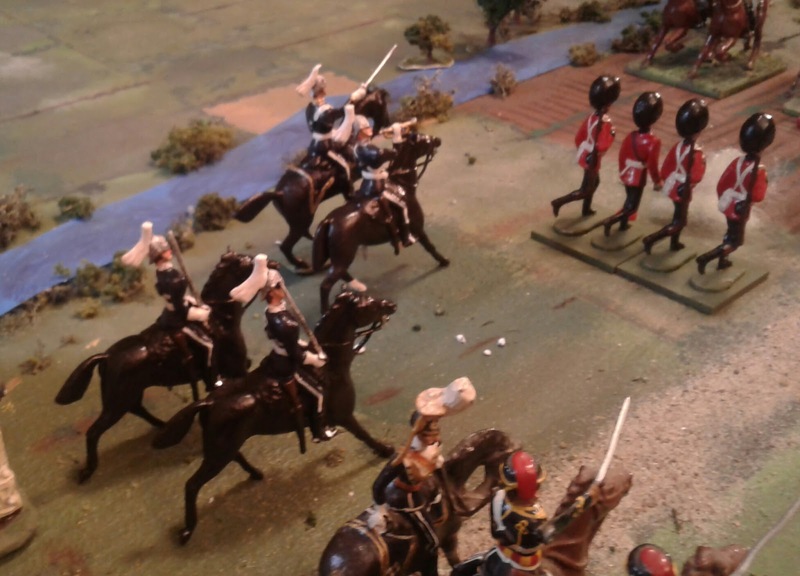 The Governor General's Bodyguard and Foot Guards rushing forward for their first taste of battle! The scenario was "Melee" from Thomas's One Hour Wargames. Essentially Red is trying to hold a vital hill while both armies rush reinforcements to the battle. The battle rages as reinforcements continue to arrive. By and large I was quite satisfied with how the rules had worked for the action at Brioche but rather than use them with a few tweaks for the offset squares I wanted to try out some alternate ideas. In essence it was a case of not yet being fully convinced that some of the changes adopted in the last two years were really the best approach for this campaign setting. a) Should I go back to rolling for "orders" with an order being required for a group of units to move rather than only testing to allow isolated or leaderless units to move? b) Should some form of regimental integrity be included and should I revert to having companies losing combat capability as they take hits, or stick with having them fight at full effect until destroyed with the only attrition effect being at a higher level as gaps appear in the line? c) Should I revert to having more dice per unit, allowing for quicker, more dramatic not say drastic combat results? Turn 6 of 15, Both sides are fully on table and Red is feeling pretty comfortable. I decided to try the alternate possibilities and by game's end decided that the rules used in the last game were better in every respect and will be reinstated with adjustments for arc of fire etc. That includes reducing units back to 1 die for firing and 2 for melee, having units fight at full effect until removed, reverting to 3 figure cavalry and sharpshooter infantry units, ignoring any role for 2 figure half company bases other than showing road columns, and allowing all groups with a Commander attached to move automatically. The attrition matter will be handled by my well tested method of having companies grouped into "Brigades" with a Commander and allowing these Brigades to become 'exhausted' by unit losses and thus unable to shoot or advance towards the enemy. The "army" will only be exhausted when all of the brigades are exhausted. Several turns later and Red is not happy at all! 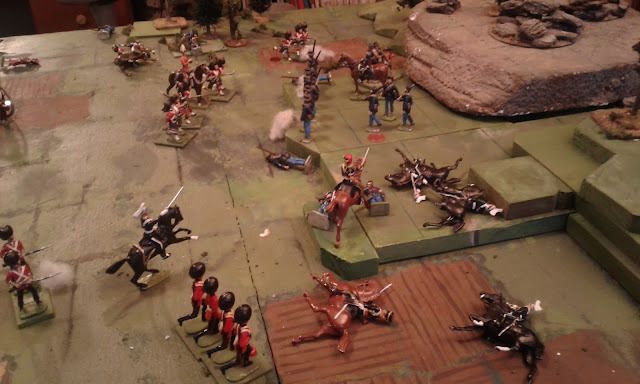 With General and gun captured and cavalry repulsed, things were looking shaky although a spectacular round of fire has shattered Blue's infantry on the plain. I've got a pretty good idea about how I want to work the matters of facing and arcs of fire but putting it in writing and having it make sense to others is going to be a challenge. There may need to be diagrams and I'll probably break a few conventions. 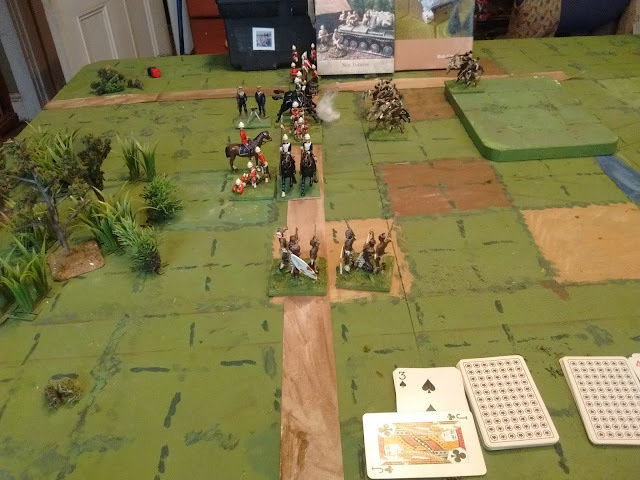 Turn 12 and a combined counter attack by the Governor General's Bodyguard and the 5th Royal Scots has consolidated Red's control of the hill and broken Blue's morale. 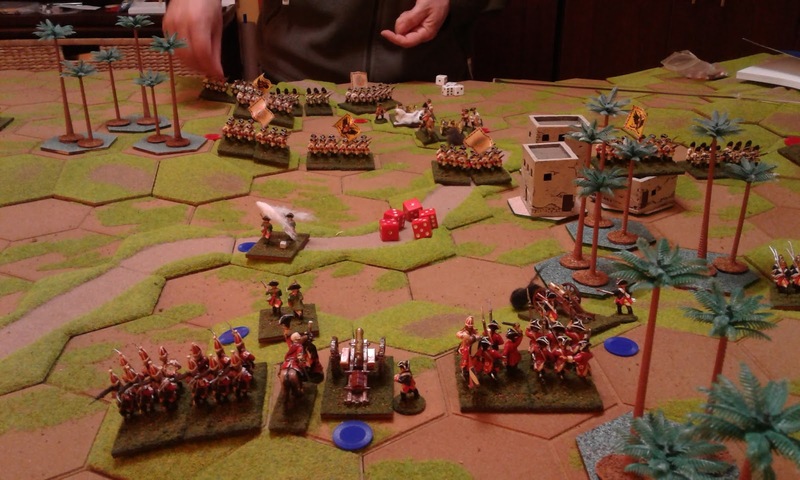 So for this week, Papal Zouaves, basing, a written copy of the rules and another game. Well, one needs to push oneself a little now and then! A moment of glory and satisfying debut for Major Denison and the Governor General's Bodyguard. Odd numbered files two paces forwarddddd MARCH! I had just about talked myself into treating myself to a nice, attractive, practical, professional, hex mat from Hotz Artworks this fall and even had funds earmarked. 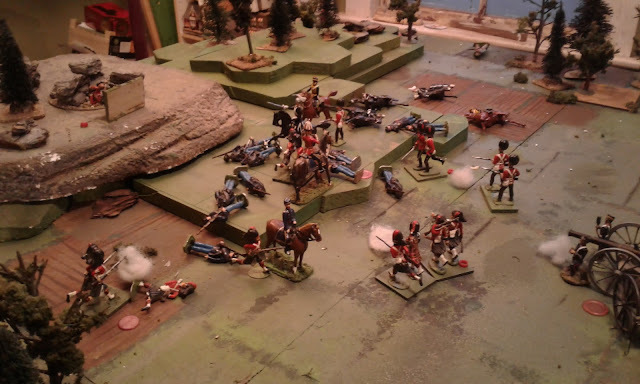 Then the Prince August 7YW artillery sets came out and I needed some additional 54mm guns and oh dear, the warchest was empty again and those damned diagonals were still there gnawing at my mind. Well they "ain't no more"! I didn't set out to do offset squares. My back up plan was to draw hexes using the Archduke's scheme of starting with offset rectangles of particular dimensions and then then adding the angles. Not being a wiz at either math or accurate measuring, I none the less calculated that I would need rectangles of 4" x 3 15/32nds" and had already worked out that I could start by shifting the Northern and Southern edges of each square in alternate North/South rows 2" South. I was about a quarter of the way done when I realized that since I wasn't in the slightest concerned about inequity in speed but only with getting rid of corners while increasing the number of directions in which a unit could travel, I should give offset squares a go. That way I only had 1/2 the east-west dividing lines to redraw/mask and I'd be done. More than that my existing hills could easily be made to fit and still be flexible with minimal work. Two hours later and the board is ready for a trial game. Now as to that other little matter, I am used to silly little things like receipts and statements going astray over the course of a tax year but a toy soldier head going absent over a mere 19 years is a different matter! All present and accounted for Sir! "Order from the Minister of Defence in Ottawa Colonel, the Princess Louise Hussars are to surrender that trumpet to the Governor General's Body Guard." 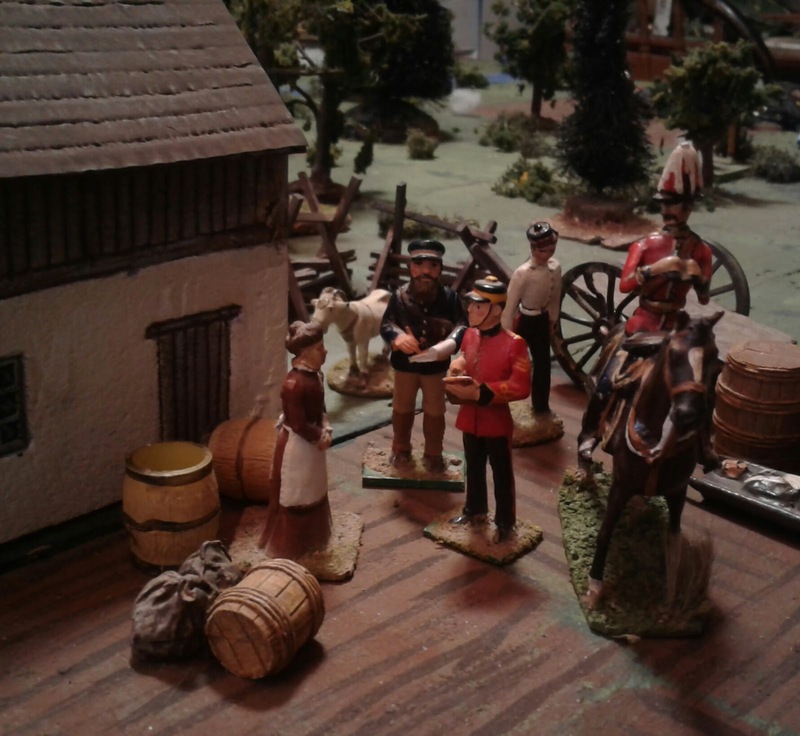 "Yes I realize you are a New Brunswick Regiment and the Bodyguard are an Ontario Regiment but we're all Canadian now and in matters of defence, orders from the Federal government take precedence and trumpets are even scarcer than rifles right now." This week promises to be cold and wet and my wife has abandoned me to go to a dog show so I anticipate a teeny bit extra hobby time. My plan is to spent Saturday getting figures and table ready and making another attempt at rewriting the rules slightly to better express the ideas in my head for this particular collection. 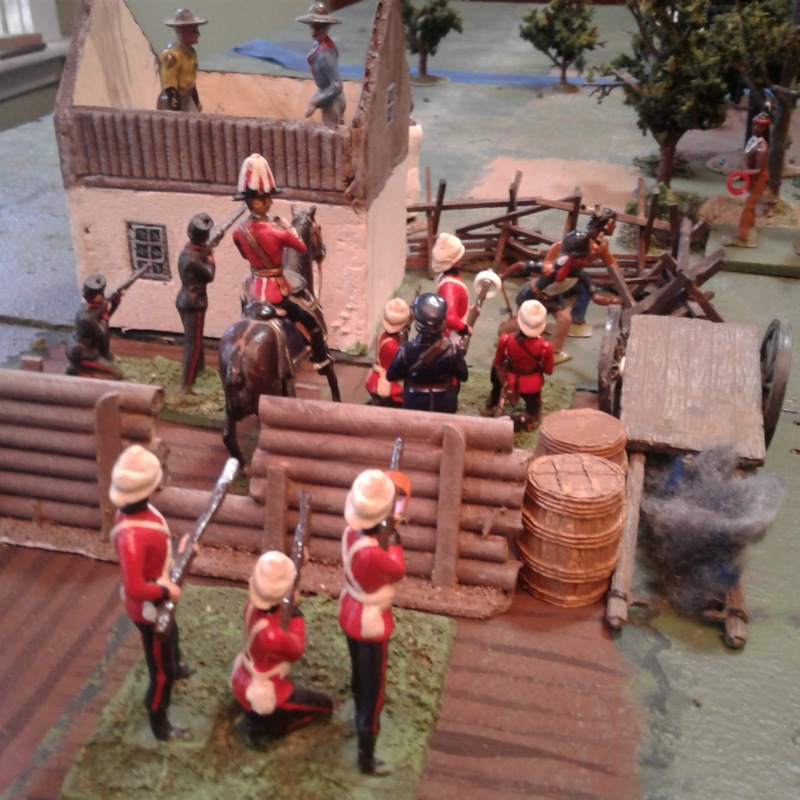 There is so much to do to bring the Canadian and fictional Fenian forces to battle readiness that I decided to start with my Zulu War forces. The 58th Foot has now had 2 figures added to bring them up to two regulation companies, each of 4 figures. The 58th Ft are now ready for action. Next up are a troop of the Governor General's Bodyguard. I ordered one 4 figure Big Wars' unit of these from Soldierpac in 1998 (I gave him the code numbers I wanted and he immediately guessed that I was doing the GGBG not some British Dragoon Regiment - he knew his stuff and his client base!) and began assembly but got interrupted by a good deal on Britain's Crimean Light Brigade and then by plastic 54mm figures. I resumed assembly today so they haven't had to wait 2 full decades. Governor General's Bodyguard (in waiting). The trooper who was ordered to become a trumpeter seems to have lost his head though. A preliminary sweep of the sorts of places where off duty, un-assembled, troopers like to hangout failed to locate the missing head and I am considering my options which include, buying a new head, making one, using a forage cap or, simply adopting the 3 figure cavalry squadron (like my US Cavalry and the largest cavalry unit that will fit in a 4" hex) as standard instead of going with 2 'troops' or units each of 2 figures like my 17th Lancers. I'll do a more intensive search before I make a decision. That leaves Sunday for a game, hopefully the first game of a mini-mini-campaign. Thanks to Rob from the Captain's blog for this. This film was the first feature length documentary film with sound to be made in Canada. The production team compiled the film throughout the world and from Canadian cameramen who followed troops through training and into combat. 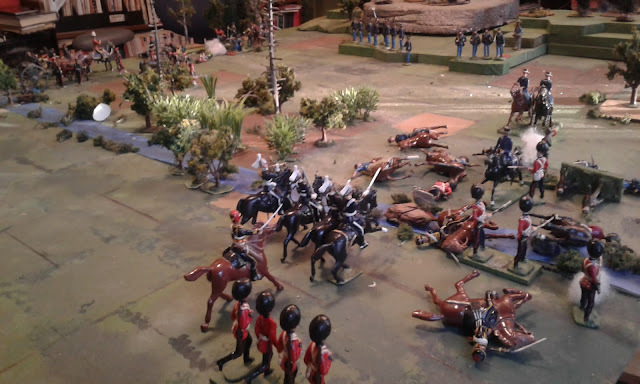 Simulated battle scenes are also included. Part 1 - The story of Canadian military participation in WWI. A review is made of the major incidents that lead to declarations of war. Leading personalities are shown. Recruitment and training of soldiers takes place. Part 2 - The Battles of Mons, Ypres, the Somme, and Vimy Ridge. Part 3 - The Battle of Passchendaele. Sequences on the Royal Flying Corps in action on land and in the air. Dominion Day 1918 festivities among Canadian Armed Forces personnel at the front line near Vimy Ridge are captured on camera. End of the war celebrations and commemorations are shown. Exceptional material includes: Princess Patricia dedicating the Princess Patricia's Canadian Light Infantry Regiment at Lansdowne Park, August 23, 1914; the sinking of the Szent Istvan, an Austro-Hungarian battleship, where sailors look like ants heaped up on one side and then jump into the sea; new military technology; war ruins and refugees; the American entry into the war; an observation balloon going up in flames; and Canadian railway troops building tracks. Canadian troops hold an Athletic Field Day on Dominion Day 1918; Canadian troops extinguish fires at Cambrai; the Prince of Wales in military uniform surrounded by other officers; soldiers in trenches, in marching formation, cheer news of the end of the war; funeral procession of nurses watch soldiers carry the coffins of nurses killed in an air raid of a hospital in France, May 1918. Officers salute the open grave. The Canadian troupe, The Dumbells, perform before Canadian troops on Dominion Day 1918. Source: Library and Archives Canada. Veterans Affairs Canada fonds, 1976-0222, IDC 115789. 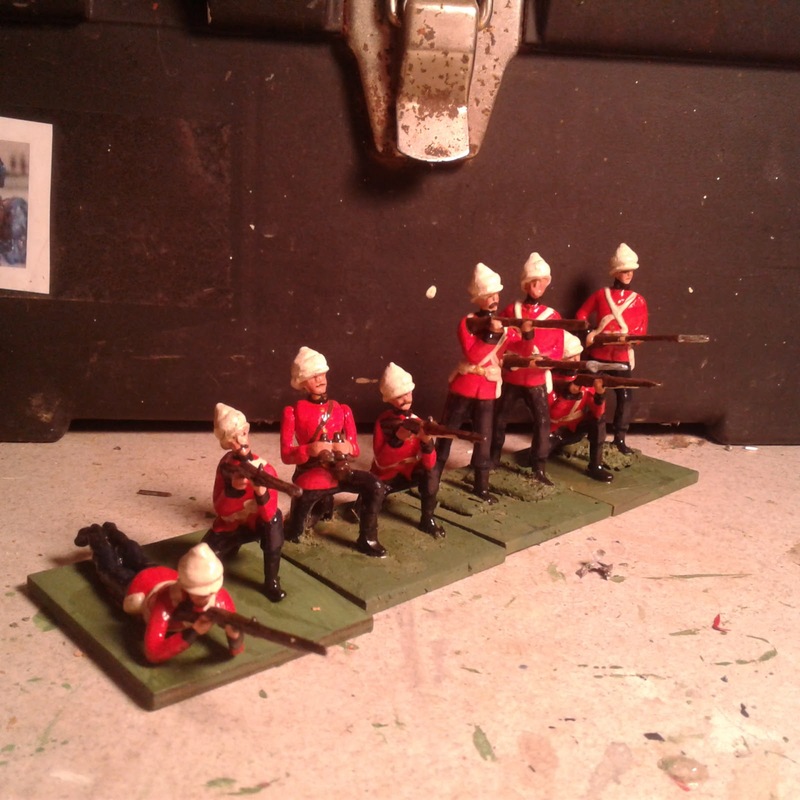 "This should be quick and easy....."
Well the first company of the Governor General's Foot Guards is now ready for duty but it wasn't quite as quick and easy as I expected. The GGFG was raised in 1872 so basically missed the Fenian Raids unlike the older, but less senior, Canadian Grenadier Guards. They did, however, send a company to fight in the North West Rebellion. Of course none of this factual stuff need affect their deployment on the wargames table and since there are only three Canadian Regiments that wear bearskin caps, of course they are in! (+ Scots Guard and antique Coldstream Guard). The GGFG were linked with the Coldstream Guards so wear a red hackle but on the left. The first challenge I had to meet was my impatience. The last toy soldiers I painted had been quite amenable to paint despite my having run out of the matte acrylic varnish that I used to mix with white or light grey paint to seal and prime the figures before painting. 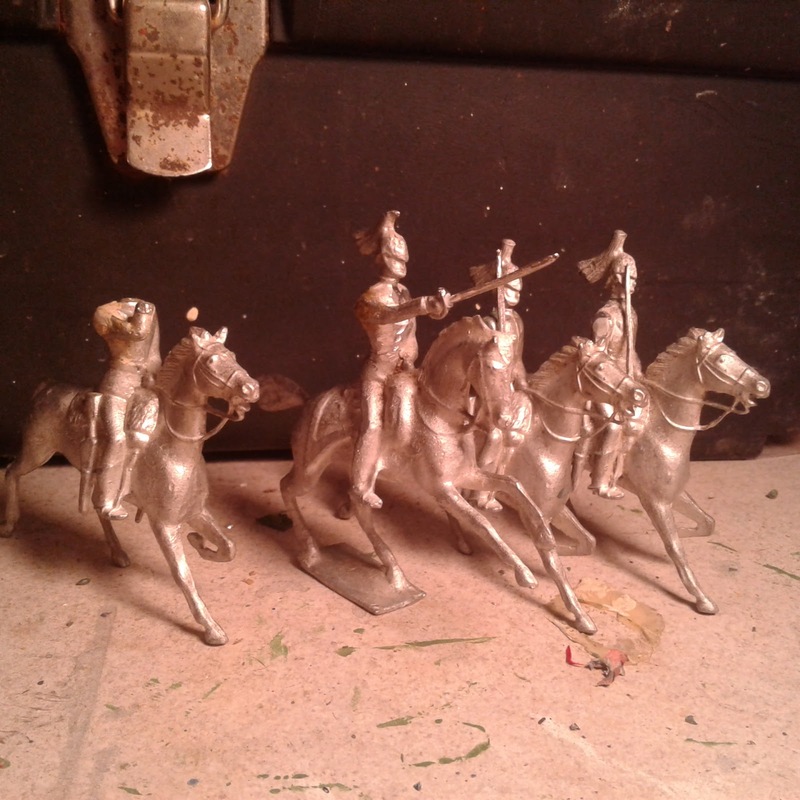 Usually I have no problem when I leave the varnish out but these lads had a rougher surface texture than I expected, possibly due to weather & humidity when casting or something contaminating the alloy. In any event, the paint would brush on ok but then suddenly as it dried there would be a gap or an exposed bit would rub off. Anyway, several coats later, with breaks to allow extra drying time, they are done. The next challenge was that I am not yet used to the real Toy Soldier look. The Scots Guard in the picture was painted c1998 and has a simple version of the 1860's cuff and lace trim and some subtle shading (now lost under gloss). He originally had a matte finish as well. Beside him is an antique Coldstream Guard with the little round blue cuffs that Britain's used, even in full dress. I had hauled him out for an example along with a few illustrated toy soldier books and found myself pondering just how far I want to go with this revived Toy Soldier fantasy? Do I want to try to make them accurate replicas of antique soldiers, make them glossy but accurate models, or somewhere in between. Not human memory, that's as fleeting as it gets these days, digital memory, as in my blog. After a week of poking about, contemplating exotic enemies, and reviewing present means and past unfinished business, I'm relieved to realize I don't need to start a new 54mm Toy Soldier campaign just yet. The three in hand will keep me busy for a year or two yet if not longer. 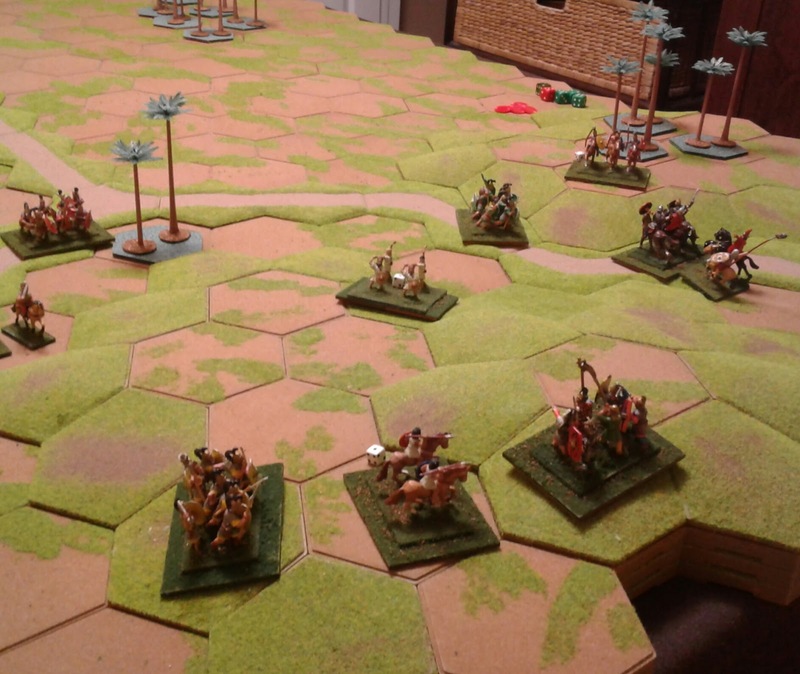 Last year I dithered a bit over grid, unit size and army size but have now tested enough options that I am happy to settle on 4" hexes (or squares in the interim) and 4 figure infantry companies with 3 figure cavalry squadrons. First and least is the "Portable Zulu War with Guest Stars". 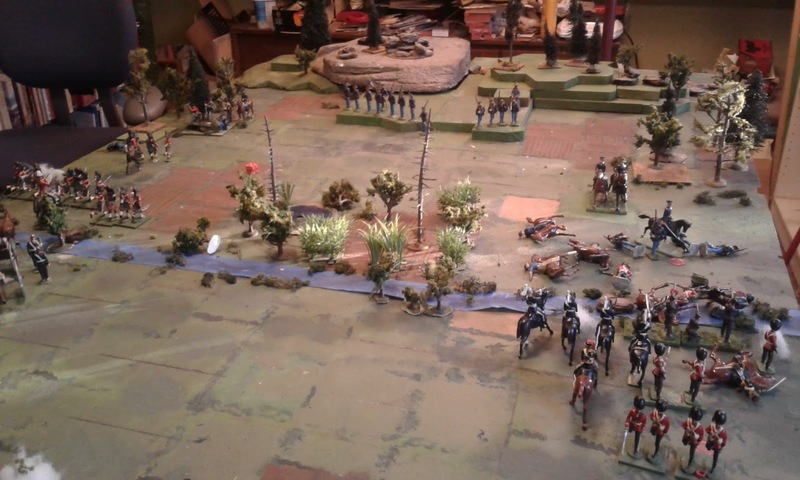 The Gordon Highlanders should not be there, especially not dressed for Tel el Kebir. Maybe one day they'll take me to Egypt but for now they'll do their duty wherever I send them. 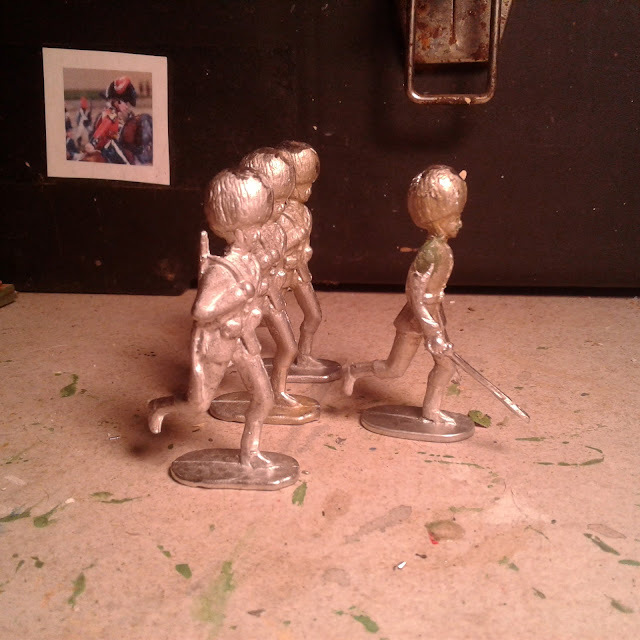 I have 4 infantry companies in sun helmets and 2 cavalry squadrons so for most games will have to include troops in less tropical dress for most scenarios but the glossy antique toy soldier creed allows that. 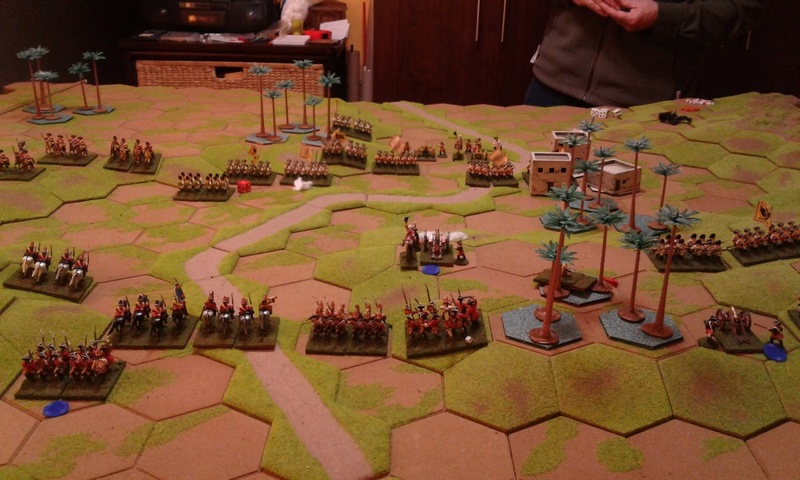 The Zulus are in more than adequate numbers. Practising for Huzzah last winter. Second is the "Cyprus Hills" or "Northwest" Campaign. 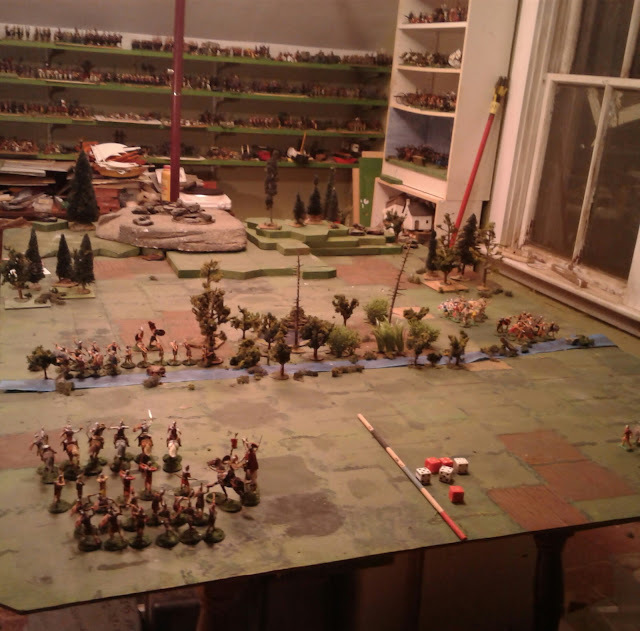 In the short term, I just need to add some Metis and terrain and tidy up a few units. 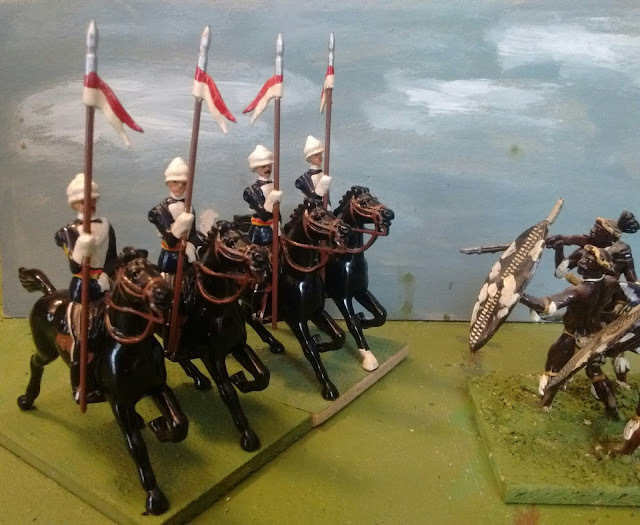 Eventually I might want to add more troops in Riel Rebellion campaign dress including mounted scouts but I'm in no hurry. The game that hooked me two years ago. Third and largest is the "Defended Border" Campaign or what if the Fenians had been more like what the public imagination pictured? To put it another way, this is the perfect opportunity for my " imagine if my Grandfather had fought a Red vs Blue wargame campaign with off the shelf boxes of toy soldiers" campaign. I now have lots of moulds for soldiers in long trousers and minimal equipment which are ripe for conversion to old toy style Civil War troops as well as Fort Henry Guards. I picture this campaign being ripe to eventually have enough troops for full CS Grant and Asquith scenarios with 18 or 20 units a side. From the game fought last Canada Day. While I was casting Guardsmen yesterday, I grabbed my Zouave mold and cast up a company of them as well. 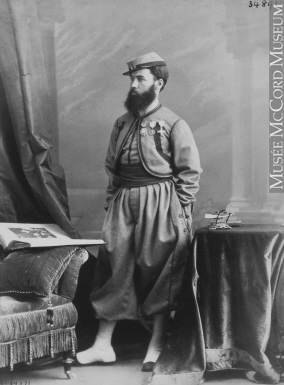 There are plenty of Britain's Zouave & Turko sets to choose from for uniforms and I'll probably do some of the traditional blue with red trousers of the New York Zouaves but given the Fictional-Fenian context, I am tempted to paint some up as Papal Zouaves in grey such as were raised in Montreal to fight for the Pope. from the McCord Museum site. I could even call them "Les Fils des Patriotes", sons of the 1837-39 rebels from Lower Canada who have joined with the Fenians. After all, if using one's imagination, it doesn't do to rein it in too tightly. I never met my Uncle Angus, my father's older brother. 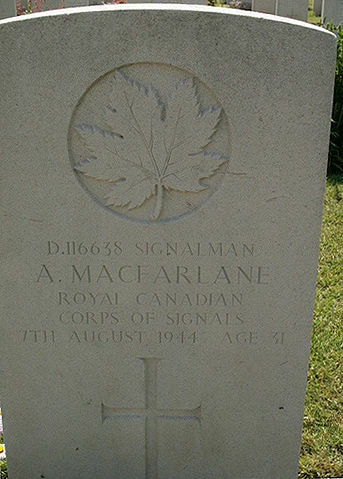 Like dad he served in the Royal Canadian Signal Corps during WWII. Unlike dad, he didn't come home. Just as I was contemplating the 'order' to expand my 54 mm armies, and pondering whether or not to buy another of the Coldstream Guards mold from Miniature Molds, John from Wargame Hermit Blog mentioned that he was looking for homes for some of his plastic figures and old molds. In the picture he posted I saw a stack of red moulds. Miniature Molds is the only company I know that uses red rubber in their molds so I got in touch. I was expecting a couple of molds but to my joy and amazement yesterday, a big, heavy box arrived choc a bloc full. Christmas in November! Today I tested a number of the molds and here is the first 4 man company entering training. I don't actually need hundred's more Guardsmen but a few more won't hurt and a few simple headswaps will allow me to recruit some line infantry and add some Britains-ish regiments to the opposing Blue army. They made some odd choices when choosing the molds. For example, there is an ordinary marching guardsman with a separate arm with a shouldered axe. You need a set of spare arms to give him a rifle. Including the axe in the spare arm set would have made more sense to me. About 1/2 the figures are in gaiters and have pouches and equipment, the rest are in trousers and no pouches. Luckily during the Fenian Raids and in the Northwest Rebellion, most militia would have worn trousers, as would the enemy, but regulars might have worn the new leggings so both will be of use and the leggings are definitely wanted for Colonial campaigns. I'm definitely going to need another shelf. Ever since I decided to allow myself to revive my 54mm late 19thC gaming I've had a small but important quandry. The only suitable artillery I have are two antique Britain's field guns. I love them but periodic searches for more have failed to turn any up, or rather very few available and none within my means. Where could I get more suitable, affordable guns? Picture of an on sale 7 pdr from the AIP website. Well, I have found three sources. Miniature Molds/Castings have a mold for an ACW Parrot which is not right but acceptable. 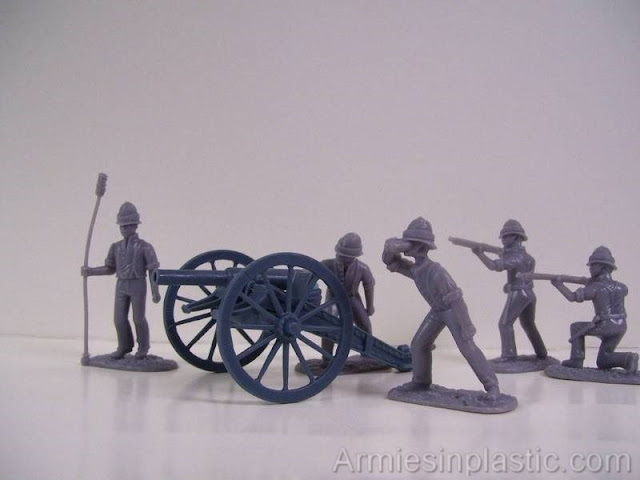 It was tempting but there are now two manufactures of plastic Colonial British guns: Armies in Plastic and Expeditionary Force. 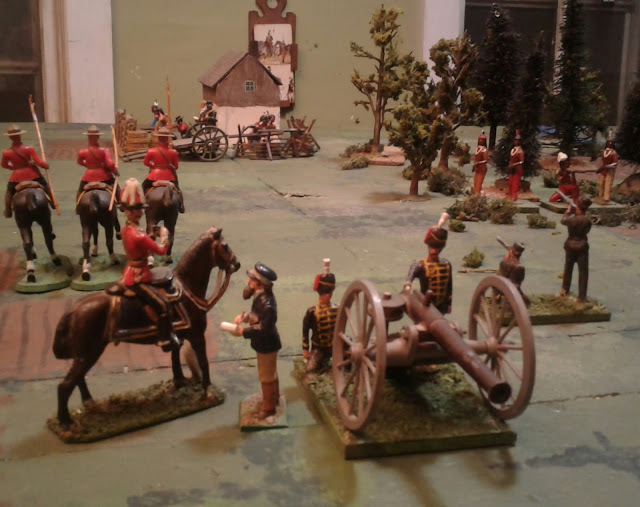 The latter looks superb but the AIP gun also looks pretty good and I liked their Napoleonic guns which saw service with my 1812 and 1837 armies. Now I just have to settle on a Foe. I think I do enough US-Canada stuff and am contemplating investigating the career of the Son of the Emir of Wadi Foulyam. Ron and I had another go at a Portable Ancient Wargame today. The Scenario was Broken Ground from Programmed Scenarios. Ron with 30 SP of Gauls was defending a hill line. I was attacking with 45 SP of Romans. I suggested that we use a turn limit for the game and suggested my usual 15 card initiative deck with Black indicating that the Gauls go first that turn, Red indicating Romans go first. If a Joker turned up the turn was over. When the deck was done, the game was over. This gave the Romans 15 turns to have undisputed control of ALL of the hills behind the Gallic start line. 1/2 way through the game. 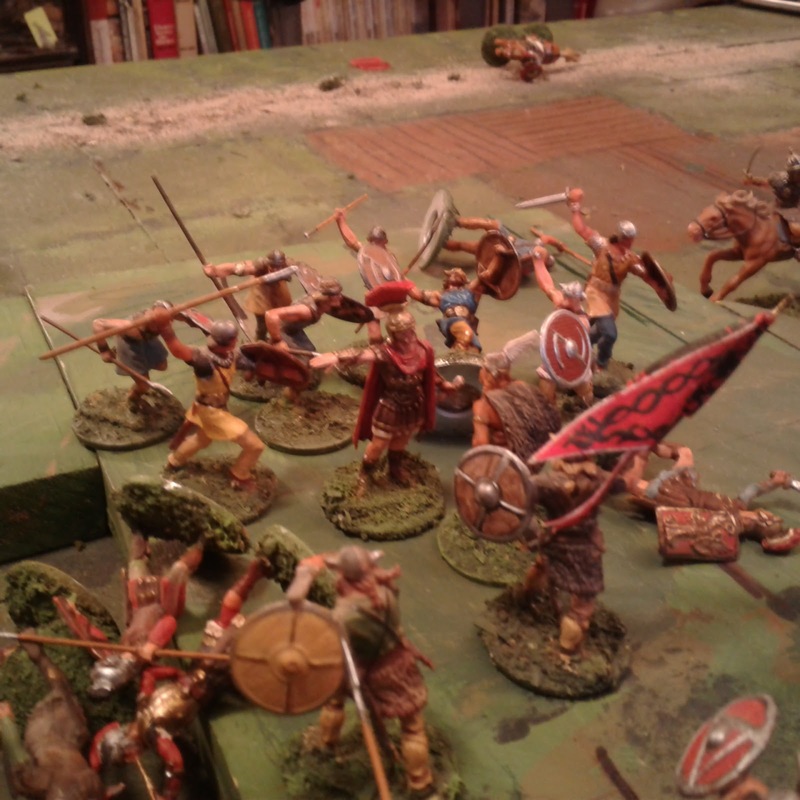 The Romans, whom the omens (die roll) advised not to bother scouting since the Gauls would obviously be sitting on the hill line, were somewhat taken aback to be attacked by the Gauls before they had even marched on and deployed! Seeing that I had flubbed the die roll to be allowed to deploy on table and given the Gauls low value in defence, Ron decided to launch a preemptive strike. Thank goodness that his combat dice weren't better and that once my cohorts started arriving to reinforce my light troops, they had above average dice! A lengthy seesaw battle began which ended with the Gauls being exhausted but the Romans still being stalled. However gaps were appearing and finally I managed to coax some of my light units to roll a double move and exploit an involuntary gap just as I finally drove Ron to his Exhaustion Point. He was pretty much forced to retreat posthaste with me hot on his heels, hoping for an initiative flip to let me catch him. Didn't happen and the clock was quickly running out. Once back near the hills, Ron was forced to turn and face first my cavalry and light troops and then my panting Legionaires. At last on turn 15 I had at least 1 unit on each hill but Ron still had 3 units defending as well as one with General attached blocking one of the passes. I managed to eliminate 2 units but only pushed back the 3rd. So there I was, on the brink of exhaustion and not in undisputed control of the high ground. A Gallic victory. 3 hours went by in the blink of an eye as the turns seemed to fly by while the advantage slipped back and forth with me trying to break through or go around Ron's line and the terrain while he kept shifting to keep his line and zones of control (ie adjacent hexes) intact and block me while whittling me down. Victory hung in the balance right up to the very last die roll! Sometimes the obvious, cautious tactical choice isn't the most effective one! His plan was risky but paid off. The following is another excerpt from the anonymous journal reporting the Cyprus Hills Expedition. "It was a cold, cloudy day as we deployed and advanced on Brioche. The orders had come for each battalion to deploy two companies in the front and leave two supporting companies far to the rear under cover. 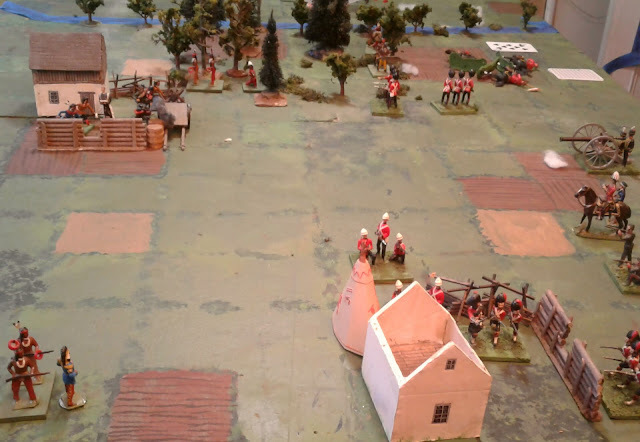 The Constabulary scouted ahead while the Highlanders, Maritimers and Sharpshooters were on the left with orders to take the Indian camp. 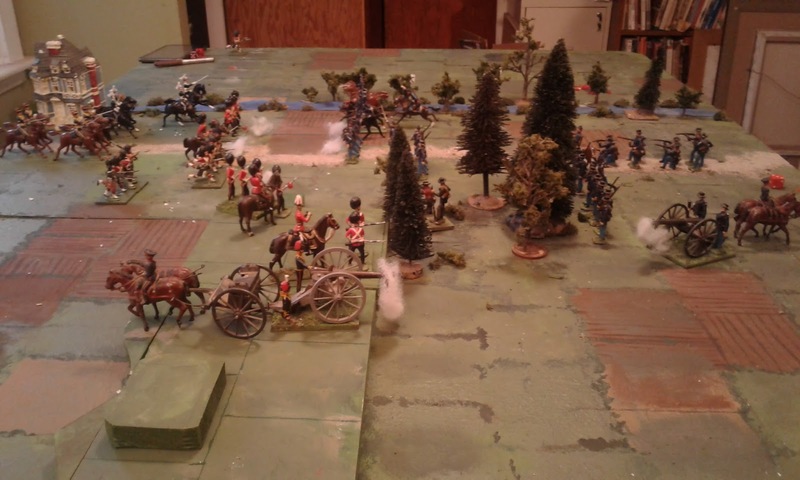 The first line of Fusiliers was on the right with orders to watch the woods and support the gun. The gun itself opened the ball by firing on the rifle pits surrounding the Trading Post." The First Assault. Rally Men! Push On! "From my position with the reserves I had a grand view of the affair. The companies on the left went at the rifle pits with the bayonet, cheering loudly but a hail of fire drove them back. Undaunted they rushed forward again and again till the Prairie was covered in scarlet patches. It was an inspiring but sickening sight." 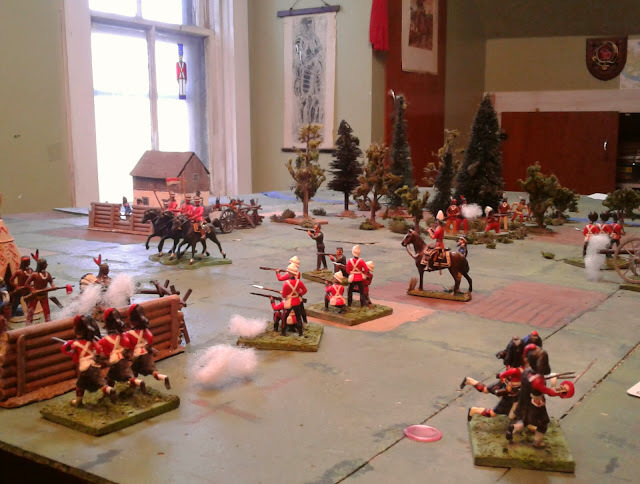 "Suddenly, the woods erupted in smoke and Fusiliers began to fall. As our lads returned fire blindly or manoeuvred to better positions, small groups of enemy warriors ran forward around our flank, crouching low, dashing from tussock to hollow, shooting quickly then disappearing only to reappear yards away. Our men were soon pinned down under a cross fire. Even the gallant gun crew were under fire but despite losses they continued to pound the main enemy position." "A gallant charge by the Lancers drove the enemy back briefly but across the field our men were pinned down and the blood spilled seemed to have been in vain. Suddenly a bugle rang out! 'Withdraw' then 'Supports Forward' ! We rose and moved forward, determined to finish what our friends had begun at such cost. " Fall Back! Forward the Reserves! "As we rushed forward to firing positions the noise rose louder and louder. The gunners had come forward again and were pounding the trading post mercilessly. To our right, we could hear a piper blowing followed by loud cheers. The firing rose to a crescendo then suddenly died away. Glancing over my shoulder I could see someone waving the red ensign from the old farmstead. We were in! Huzzah for the Highlanders! Huzzah for the Farmers and Lumberjacks from New Brunswick! " "There was no time to celebrate though. The sun was sinking low and the enemy in the woods seemed as firm and elusive as ever. We could hear the thunder of hooves behind as the Lancers swept around to sweep the Indians from our flank and drive them back. Alas the Indians shot true and men and horses went down in droves. Alas the Gallant Six." "Again I heard the pounding of hooves but just a galloper not another troop of horse. 'All in! Advance on the trading post with all speed while guarding your flank. The gun will move on its own'." "The camp is ours! Reform! Advance!" 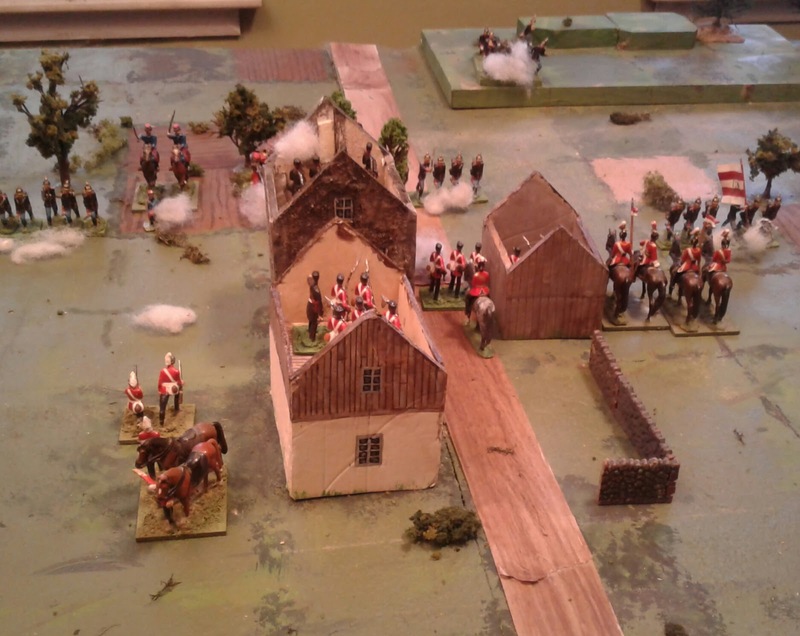 "Across the open space we could see the Yorks forming up outside the town with Douglas at their head. 'Fix Bayonets! Charge!' Like furies they doubled across the fields. Bullets rang out not only from the pits but from the edge of the woods and we rushed to cover them from that quarter." 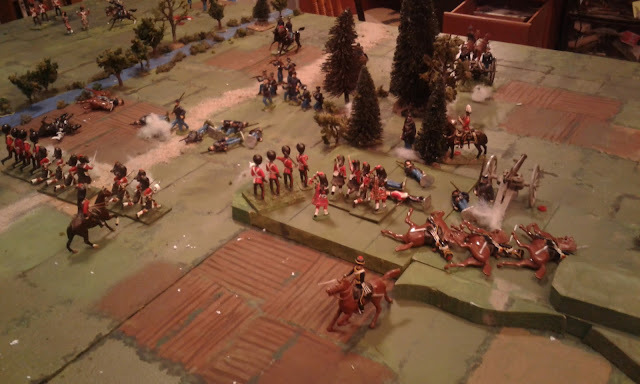 "From our position we could see the Metis and Indians starting to slip away down a little hollow a few at a time, some mounted, some leading heavily laden carts but with bullets singing around our ears there was no time to stop and consider the matter." "A final burst of fire another round of cheers and our boys were in amongst the rifle pits! There were a few final parting shots then all along the line the enemy faded away into the deepening gloom of a November evening. We'd done it!" "The excitement of the day was diminished somewhat by the news that the enemy had had just time to slip away with our d.....d dinners! and our RUM! To think, if we'd been just 15 minutes sooner... Oh well. It was real soldiering and we can be proud of our bravery under fire as we tend our many wounded and our dead. Thank God that the latter were fewer than we had feared." The Reckoning at Widow MacPherson's Storehouse. "Its nae ma fault yer honour that ye took so long and that bloody priest smashed yer tuns o' demon rum, those that your bloody big guns didn't blow up, nor that hungry men took yer beef and biscuits fer their wee hungry bairns. Ye and the Gentlemen in Ottawa maun pay what ye owe me all the same as I hae stored it for ye and ye must pay for the damage to this house of mine but I'll gie ye a good deal on some sacks of dried peas I hae in a safe place, since ye've come so far and will be hungry." This game was based on One Hour Wargames Scenario 15 Fortified Defence. Red has 15 turns to capture both fortified "towns". Forces are roughly equal but Red has the option to reset once per game. When he does he clears off all of his and his whole force appears on the board edge again to try to finish the game. 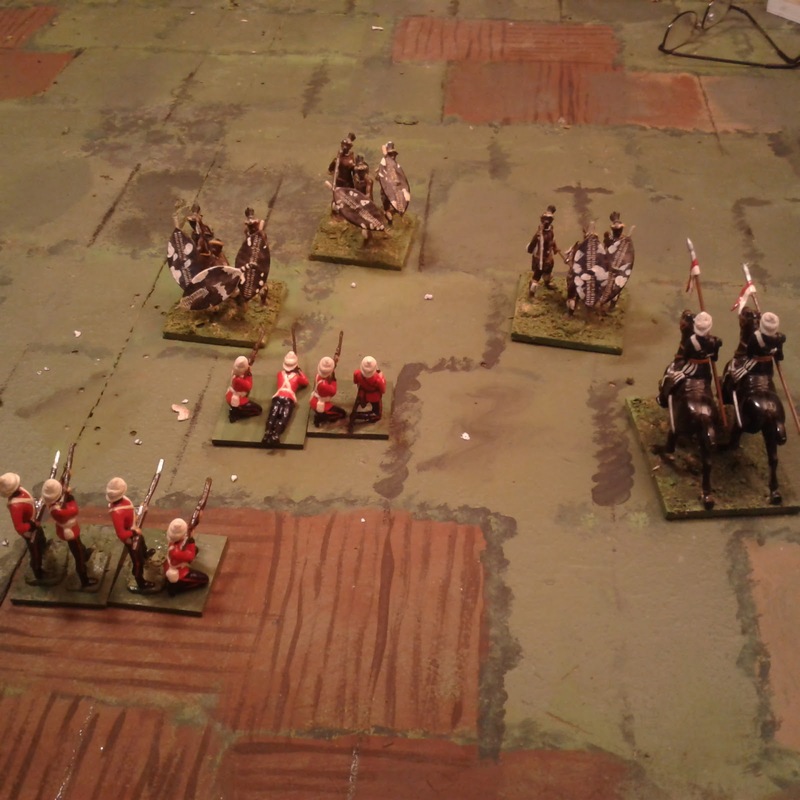 Black had 12 Native riflemen (dismounted Irregular Cavalry mostly) with 2 Leaders. 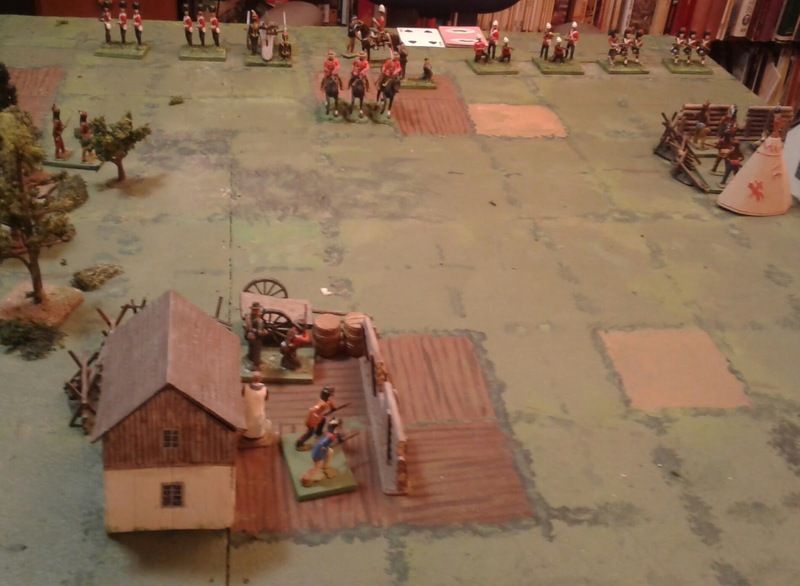 Red had a General, 1 cavalry, 1 sharpshooter, 6 infantry, 1 fieldgun. As Winter approached, General Douglas decided to march the Cyprus Hills Column to the trading post at Brioche to collect the stockpile of supplies that were supposed to be waiting there. As the column approached Brioche, scouts came galloping back signalling enemy in sight. 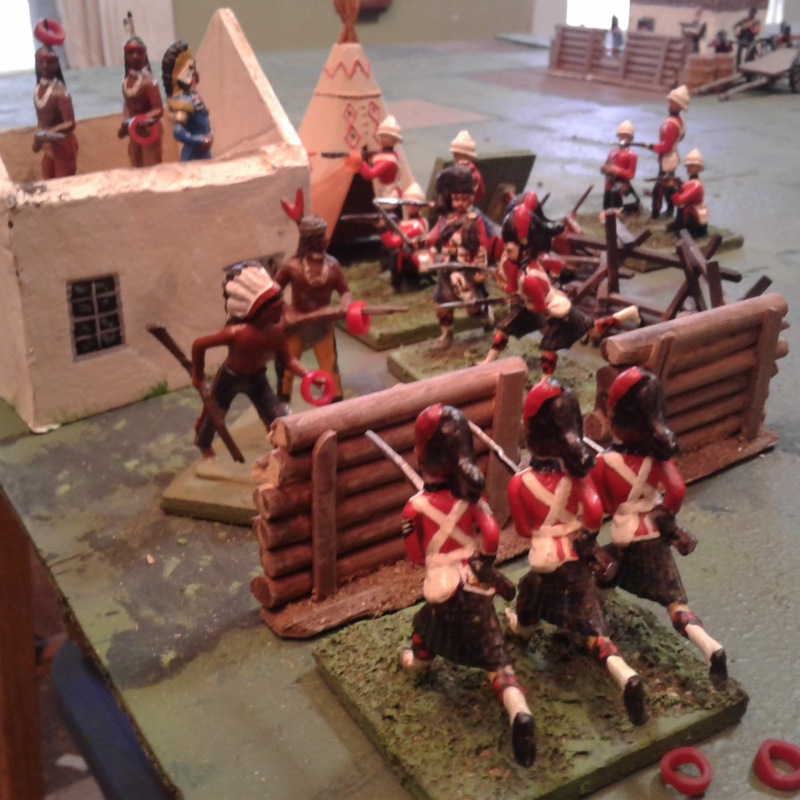 They reported that Metis and Indian Warriors could be seen barricading the trading post and digging rifle pits. "Well boys, looks like Pere Corbeau has your rum and biscuits. Lets go get them back!" 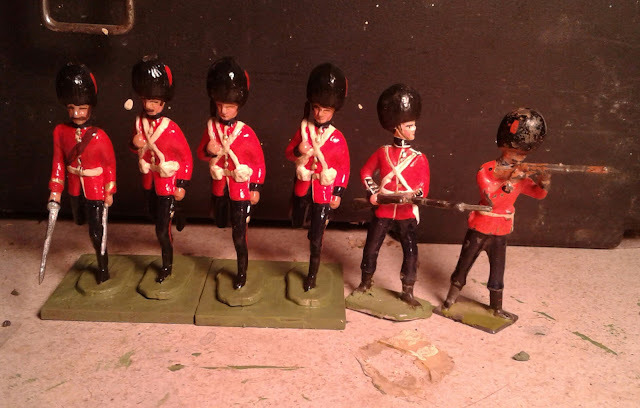 I had decided in January to allow myself to expand my 54mm Toy Soldier collection again and let it take exclusive occupation of the late 19thC which is why the existing 40's for the same period were officially transferred to the early 20thC campaigns. How do I forget these things so quickly? (UPDATED) Rainy Day Games and their Consequences. Monday was a windy, rainy, day and the table was all set ..... obviously it was time for another game. Game 2a. Same terrain, different armies, different rules. 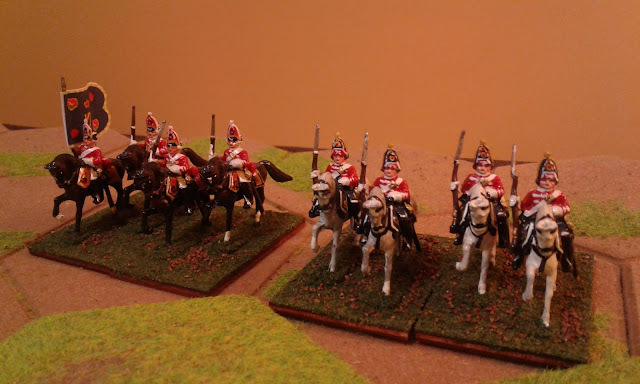 I rolled up 1870's Square Brigadier armies using the OHW lists giving Red 2 Cavalry and 4 infantry. 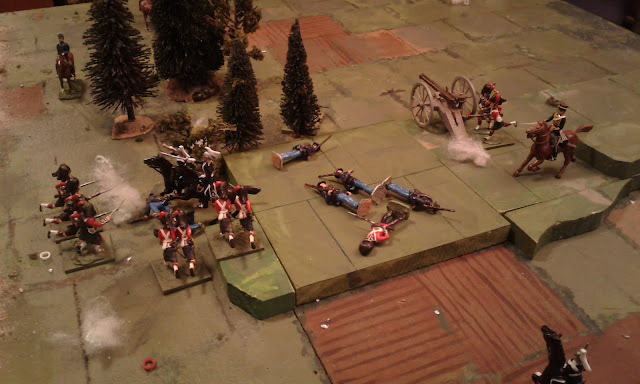 (Technically 3 infantry plus either a skirmisher or zouave unit but I kept forgetting to give the Rifles their sharpshooter bonus.) 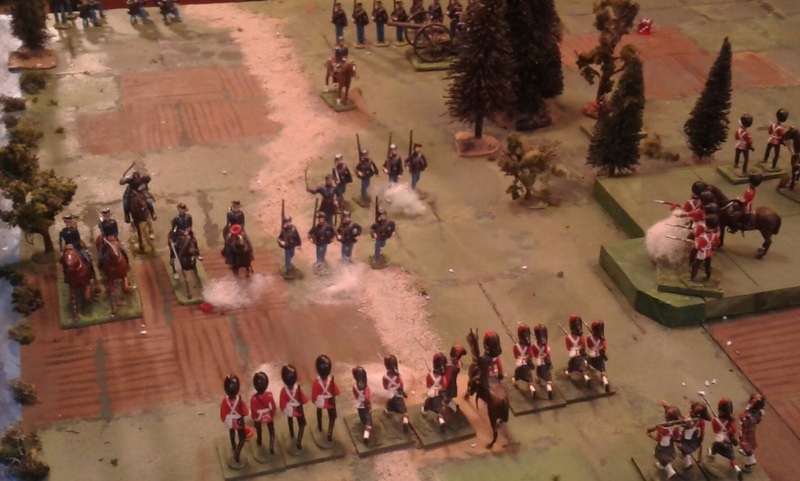 Blue got a gun, 1 cavalry and 4 infantry. The game worked OK but wasn't particularly interesting as it quickly bogged down in house to house fighting and it didn't feel quite right for the period. In theory the support rules should allow a group of adjacent "companies" to feel like 'battalion" but they don't, especially since the rules don't differentiate between a company of the same battalion or any adjacent friend. Works OK for the 20th C where companies were larger and spread out, being forced to some degree to act as separate units tactically while being coordinated by battalion or brigade HQ. It didn't quite look and feel right here though and never quite seems to for this sub-period. That was only part of it though. I went back and looked at the scenario again and realized that I had screwed up the translation of map and forces to the table. The scenario was designed for a 36"x36" table with about a 6", maybe 9" wide town in the middle and 6 units each of a 6" (recommended) or 4" frontage. I had increased the table to 48"x48" with an 8"x8" town and reduced the unit foot print to 4". Instead of being able to hold 1 unit or 1/6 of an 'army', my town could absorb 4 or 2/3 of an 'army'. Ah. 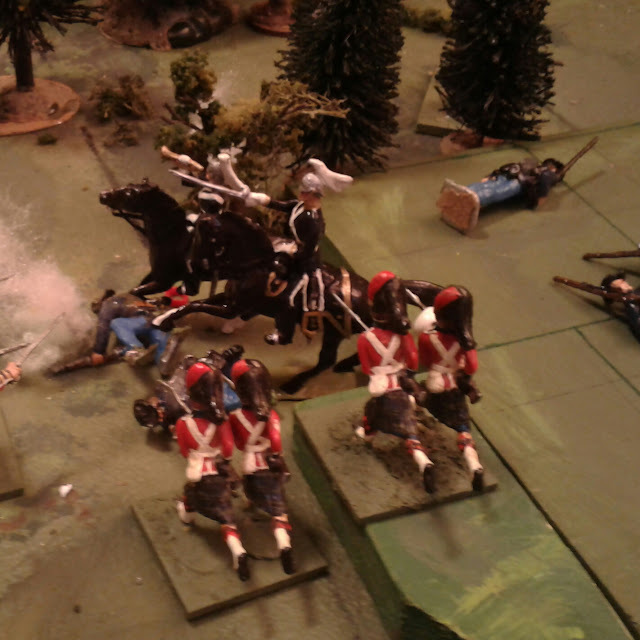 When I tried this with my War of 1812 troops a year ago, I had doubled the number of units to compensate. Game 2b. The unit footprints have been enlarged. The game had much more of the look and feel that had been in my mind. Of course, since the rules have not yet been updated and these troops have been resisting the orders to conform to 20thC standards and so the infantry were using two different basing systems, the game was a bit loosey-goosey at times, but it still felt right and worked. One example of the indecision was whether the typical 1870's/80's deployment as a heavy skirmish line for firing with supports and reserves to the rear was better represented by a single line or double line since I had rejected my old way of doing it with a firing line spread out in front with supports in column 6" to 12" behind them. Looked good but was a pain to track in action especially in armies without distinct regimental uniforms. 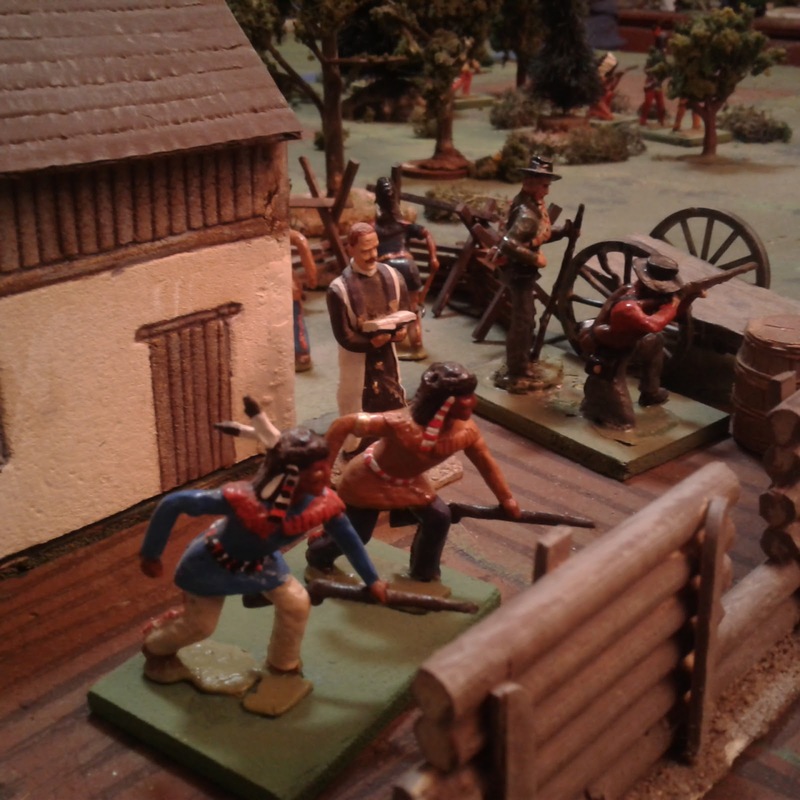 Anyway, the game worked well with larger units and more of the action took place outside the town. Red had some disturbingly low die rolls and eventually both armies were exhausted but clinging to at least a quarter of the town so when the dogs signalled that dinner time had rolled around with three turns left to go, I called it a draw. 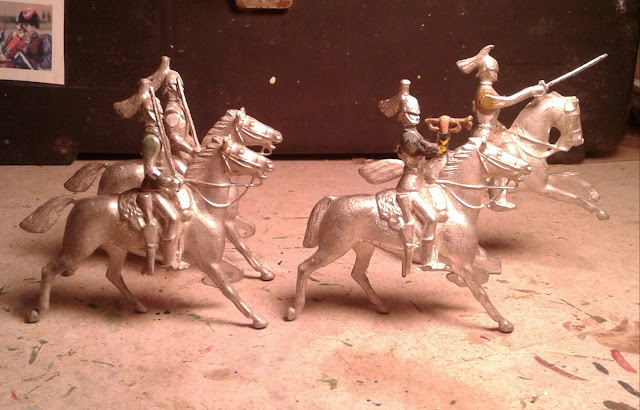 It would seem that the 1870's/80's is back in 40mm and I need to expand my list of active collections/"periods" back up from 9 to 12, refurbish and complete the troops, and finish the update to Hearts of Tin. I'll add all that to "The List". SEE NEXT POST FOR UPDATE!